Since some certainly don’t know how to get the Dragon Balls here some useful information to collect all. 1. The Dragonballs you get at the PQ tasks in the city, whether you play online or offline. 2. Do you get it after fighting the random spawning time Patroller. 1. Start the PQ task number 2 Attack of the Saiyans. 2. Defeat Yamcha, Krillin and Tien. 3. Look at the entrance to the palace of God whether there is an NPC. 4. Speak to him and accept the challenge. 5. Defeat him and see if you get the 1x 1x material and key object. 6. Once you get 1x 1x material and key object you completed the mission. Congratulations the first Dragon Ball is now yours. This can be repeated as often as desired. Have fun and good luck with your search for the Dragon Balls! Here is the hidden victory condition, which gives you a higher chance to receive a list of skills. There are always 2 other conditions that are listed here with each other. 02: Finish in under 5 min. 03: Raditz HP over 50%. 04: Finish in under 5 min. 07: Exit in 10 minutes. Receive all 7 Dragon Balls. 09: Vegeta’s HP over 50%. 10: Complete in 10 min. Defeat Ginyu Burter and Jeacy. 11: Guldo’s HP over 50%. 12: Complete in under 5 minutes. 13: Finish in under 5 minutes. Defeat Frieza and revived opponents. 15: Finish in under 3 minutes. 16: Help Vegeta and Vegeta must survive. 18: Complete in under 5 minutes. 19: Complete with Vegeta and Gohan Transformed. 20: Complete in under 5 minutes. 21: Defeat Piccolo and Goku before Gohan. Win without defeating the Cell. 22: Defeat all appearing opponents. 24: Complete in 10 min. Defeat revived Gohan and Cell. 25: Defeat Vegeta and Piccolo must survive. 26: 17 and 18 shall survive. 27: Defeat all Cell jr.
28: Defeat all Cell jr. Collect all 7 Dragon Balls. 29: Complete in under 5 minutes. Defeat all the enemies that appear. 30: Great Saiyaman must survive. Defeat the revived Friezer and Cell. 31: Complete in 10 min. 32: Complete in 5 min. 34: Majin Buu’s HP must be over 50%. 35: Complete in 5 min. 36: Complete in 5 min. 37: Super Buu’s hp 50%. 38: Majin Buu must survive. 39: Defeat Videl and Piccolo before Gohan. 41: Defeat Gotenks before Vegetto. Defeat SSJ3 Gotenks and Super Vegetto. 42: Complete in 3 min. 44: Complete in 5 min. 45: Complete in 5 min. 46: Complete and defeat all enemies. 47: Complete in 10 min. 48: Complete in 10 min. Defeat revived Friezer, Cell and Kid Buu. 49: Raditz Nappa and must survive. 50: Complete in 10 min. 52: Complete in 10 min. 53: Defeat Broly with Gohan must survive. 54: Complete in 10 min. 55: Complete in 10 min. Defeat Gohan, Broly, Bardock and less than 5 min. As everyone knows you need all 7 Dragon Balls to summon the beloved dragon. 4) Quest normally make ready. Repeat until you have all 7 If a traveler appears, simply restart quest. As many already know, there is a secret saga. The switch can easily free: you have to collect all 5 Time Crystal Shard and then go to Trunks. -The First splitter you get when you have the Demigra saga ended. -The Second splitter you get when you talk to "Recon". It is located directly at the stairs to the area in which it is time chamber. -The Third splitter you get by terminating the PQ 49. -The Fourth splitter you get by making PQ 14 or 18 (there is a third PQ, but I have forgotten). You have to finish these quests with a finish Ultimate, ie, they must meet the secret conditions. -The Last Splitter you get by PQ 2 or 21 (again, there is a third quest, but also forgotten) ended with an Ultimate Finish. Now you have to Trunks and it starts with the secret saga. But beware: the first mission is very difficult. So rather work out very well and collect good super and ultimate attacks! The easiest way is with a Saiyan, Super Saiyan because the AI is not consumed. Once you have all the time in splinters found, one come to this mission. You have to start with yourself Bardock against many Frieza's soldiers and then Frieza. Approach the fight as usual, Bardock is quick KO, because he has little life and mission would be lost. Concentrate on the opponent to Bardock. Should protect Bardock top priority. It's best to: a Saiyan, Super Saiyan 1 or 2 (since no Ki-consuming than SSJ for Super and Ult. attacks). very important: Z-soul: Why Duuuuu? (Every time you hit an opponent KO Ki is completely filled. Maximum charge might be able to load or the like as a super attack by Ki. For attributes: Max Ki and Ki-Exploded Views Superangr. Should be relatively high. Enough health is also an advantage. Energy capsules to restore health. Tactics: (Part 1) If only soldiers are there to protect Bardock, collect Ki (loading or melee), SSJ be with Ult. Reduce attack opponents, especially near Bardock. Repeat comes to frieza. Part 2: Here you have to protect Bardock and at the same harm freezer. in principle as simultaneously harming above only for the purpose friezr, so mission is over. While fighting style is not spectacular, but the mission is relatively difficult if one is not until the level 50. There are a soul with the most PQ and SQ also is much easier to create. Class, equipment and playing style is completely irrelevant. It is the Z-soul "I am neither God nor Piccolo". You need to establish that soul souls "Feel the wrath of Namikaner" and "This world needs no God"
Feel the wrath of Namekianers provide it by the mix of underestimate the earth is not (PQ 6) and I have to protect Guru (PQ 14). This world needs no God gets her (buyable objects in store for 4000) by the mix of double and only one soul echo device (PQ 12). This soul boosts not only ALL attributes, but also provides a quasi God mode. Because if your Ki is fully regenerated this soul your hit points. It has already happen a lot, so that you still on it goes. And as it makes from time to time by itself. Even Ulti-attacks. Now critics will say that yes it needs full Ki, but Ki for the attack USER. Right. But if you attack and damage of, the Ki-bar fills. Once it is filled, just short fly in circles and you've got enough back or even full power. I have finished with this soul with the story level 40. As a race I chose a Namek. 40 points in life, 48 in Ki and the rest in Super-Ki-explosion. Billa, whist and Demigra were absolutely no problem. Keep your distance, start super attack (I use hell spiral), Ki fill and over again. The Ultimate capability "break-cannon" (the ability of Nappa) consumes the entire AI for the attack. The more AI you have, the more damage that foe. As a Super Saiyan consume AI attacks no AI. From this we can draw the following advantage if you put many attribute points in AI and AI-Super-attacks, one aligned with the ability to do more damage than with other Ultimate attacks. Through the Super Saiyan the AI is not consumed. That is, the more AI you have, the more damage directed the "break-gun", which AI is not completely consumed because of the Super Saiyan. The ability to charge the energy again is of course recommended to use and the ability to "teleport" to come quickly to the opponent and the ultimate attack. This combination is especially during story missions well as the opponent does not fly away after a certain number of hits the attack (as is the case with normal enemies). Melee attacks have against Story opponent with a higher level as the player often does not make sense, since they are automatically blocked because of the level difference. With the combination of break-gun + Super Saiyan I could remove the level 75 opponents without problems half an HP bar in story final battle, even though I was level 35 and the attributes AI and AI-Super-attack not only as each had 30 points distributed. It is then activated when the Ulti from the master uses while with him in teaching. Example: Vegeta is the Ulti "Final Flash" if you are then continue in teaching and applying the attack is quite common Z-help, which makes your attacks more powerful and the not insignificant. 4) Each master can always be replaced. 6) Many Skills (SSJ / Kaioken), after the storyline progress in the business also enabled. For spec I can not comment too much so, as each plays differently. My 1 Char was a Saiyan, and I love to stay in the SSJ mode. Yet this I am more in close combat, so I Skille much on AI / melee. You get both desired options until the skills of Super 17, Super Shenlong then. You can make an infinite combo, by taking advantage of 5x weak attack and then Death Beam 3x fire, then answer it briefly again to the opponent (just the controller slightly push the opponent) and again 5x weak attack and Death Beam, etc. My highest combo is 66 hits, then the enemy has always been dead. : D I play someone from the Frieza class, possibly advantageous because of the speed to again get at the enemy after the 5 low-attack- Hits + 3x Death Beam. If the opponent has no more stamina, he is supplied with it. Also in rank match the opponent has no time to escape, unless he has to get out endurance. It also, incidentally gets a "reward" if done in a fight over 50 Hits - this is called "combo Fiend". To help your score rises again to beautiful, easy to reach Z-rank at the PQs for example. A higher combo reward is no longer followed. The most powerful attack in the game is blue Hurricane (an attack of Burter). If your enemy gets so beautiful, is gone, the entire life bar or 90% of it in general. The more opponents in this hurricane, the longer and more devastating this attack is. This one gets in the PQs the Frieza saga, just look around. This event can be very annoying as it comes, that Pan must come as the last of the 3. Unfortunately, the little lady holds out little and cut your own online players only too happy to blind the opponents. That's why I've come up with a simple way how to do it alone with 2 Com partner almost effortless. As a partner or Krillin Yamcha best, whether jointly or equal. Right from the start you will choose all 3 as a target, but usually go Trunks and Pan straight after on your partner going on and only Son Goku wants you to the leather. Invite you hit right at the start by Maximum charge to let you if need be. Mostly he quickly loses interest in you, so you can recharge time to view the Ki. Is your Ki full, fly a little further away from pan and is targeting one of the other two. Now use ridicule, causing the opponent choose you as a target and comes to you. Use the time until he is with you to transform and then attack him with the Spzial Hell spiral until it is level defeated. The reason why it uses the spiral is that it is very narrow, so you meet virtually only really the goal, what you will take and what Pan benefit. As soon as the enemy is defeated, you invite again and do the same with the other enemies, until it also lies on the ground. If all goes well, Pan has even more than 50% of his HP. Incidentally, if after you have defeated both the word "finisher" does not appears, restart the mission, because if it does not appear, it will not show up. With this simple method, the bonus task is no longer a problem and the super-Genkidama hopefully yours. Do not underestimate the Kaioken !!! Similar to the Super sayajin where only the transformation Ki consumed and unlimited use ki attacks (as long as you are maintaining the transformation) can during a 20-fold Kaioken the stamina bar use indefinitely. That you may be unbeatable in a dogfight because you can watch unlimited teleport and often evasive skills to use as long as the Kaioken is active. In addition, it increases the attack power and makes very strong combos possible. With the Y combo (Xbox) chip off, with A behind teleport Y combo etc. If you have used the attack super absorption during the combo can you transform maintained a long time. Abilities: 20x Kaioken, super absorbent, exhortation, teleportation. The ultimate energy. Ultimate Saiyan. - Defeat Gogeta and Super Shenlong. Preface: You can get the Dragon Balls in different ways in his possession. This method, which I'll explain in a moment, in my opinion, one of the fastest (since they can be farms already at a low level) and effective. Everything you need is (as always) some time and a little luck. 1.) You start the parallel Quest # 02 - Attack of the Saiyans (Best reaps your item in offline mode, otherwise it may happen that your opponents)! 2.) Defeat your challengers 3 Tenshinhan, Yamcha and Krilin (sequence and type of finishing's are irrelevant). 3.) Then you say that even in this stage an eye out for a time soldier who will be located at the entrance of God's palace (If that time soldier not to be found within the 3 defeated enemies, simply press START and select RETRY. The quest starts then all from the front). 4.) If the time soldier to be present, he calls this a fight out (this works by you talk to him). 5.) Do you pointed your opponents into the barriers, get their items. Pay attention on it, which is displayed "get key object" at the bottom of the screen! (If it is not the case, START and RETRY. Can of course then be, that is the time soldier not to be found in the next experiment. This event is determined by the random ALWAYS). 7.) Once you succeed, a Dragonball should be listed under "Received Items". (The star number is random, but fear not, you can not get twice). - The more dragon balls you have collected, the lower the chance of getting another! Therefore, it may already be taking the sixth or seventh Dragon Ball some time! (So ​​for me it has lasted on average 45 minutes). - The fastest way to work the whole course with a high level character! - 99% of stat points obtained after each level-up, I invested in hit points (= life) and super-Ki-explosion. (This you can plug in good and even better deal! So the damage to my abilities heard banned xD). 2.) "Maximum load" to the automatic charging of Kish something to speed up (there either in parallel Quest # 32 or after completion of this mission in the shop). 3.) "teleportation ball", hurls a strong Ki-ball on the opponent. This attack is also performed relatively quickly. (Are there parallel Quest # 38). 4.) "Meteor Crash", so I like long combos and wanted to at least one shock attack (Available Now). 1.) "Super teleportation Ball", a larger and much more powerful version of the standard teleportation Balls. Execution takes about 2 seconds, the damage on impact is comprehensive and immensely! 3.) "super blast wave" to quickly prepare opponent Combos an end and push him away. -In Under 3 minutes to create. -Super- Genki dama (Ulti of Goku GT, GT DLC Pak 1) get in PQ "Small but strong!" Important: To get Ultimate attacks you have to complete the quest with an Ultimate Finish, since these are different from normal abilities only dropped. Further, there is not always a screen display "ability to receive" but this can also occur as a quest reward, according to the box with reward objects and, if found objects. This can be noted in advance required to certain triggers. Raising an event is nevertheless no guarantee, but only a condition for receipt of the attacks. These are dropped when the conditions with a certain probability. So do not despair if you need a few tries! This Ultimate attacks are so already among the strongest in the game but have other advantages. First, it can again be reinforced by the Z-Soul coach by it in sparring (some also by PQs) can receive, among other things with it. On the other hand you have the ability when inserting the chance of a Z-help, if you have used the coach whose ability you, you have chosen. That Boosts attack again. If both are together the case, ie Z-help plus Z-Soul coach coming the other Ultimate Attacks what the damage in terms no longer ran. - Z-soul of Cell "Enough played." (Get in PQ 24): Strengthens the "Perfect Kamehame-Ha!" and during the onset you take no damage. This makes the interrupt moves the impossible and since then I never happens. Alternatively you can also the soul "When I reach the perfect shape ..." take it boosts all attributes by 5 arrows (at full life. In TP-loss, the effect, however, deteriorated) All thing is a bit of farming and needed some mixing In order to receive this soul! The best Z-soul that I have found so far is "When I reach the perfect shape ..." 2. Cell shape. This soul invites your Ki and automatically boosts all attributes by 5 arrows, as long as you have genügent TP. Sink your TP also decreases the effect of the soul. However, this happens only after about 1/4 loss of HP bar. It is therefore advisable to bring. Siese soul for the TP to Max. Mixed "You never hit a cyborg" and "Haha! Gotcha!" to "Ha! Thanks for the energy" to obtain. Mixes "I am your brother" and "How easy is not it!" to "When I reach the perfect shape ..." to get. After much mixing plant and combined anti-Onen of souls that was the best soul I could find. Check them out for times. I think you will then no longer wish. In the game there are several objects, ie objects equipment that you get by you talk to at a certain quest a certain NPC (who occasionally appears). An example of a subject is "Tapion’s sword", is also a posting that there. 1. "Helm of the Great Saiyaman": This piece of equipment you get in PQ 31 "Majin chaos". Have you on the map "West capital -. Outskirts" every 10 Majin Boo (small) defeated. You will then be on a path at the end of the portal to the "world fighting arena" is. Talk to them and you get the helmet. After completion of the PQ he is then listed in the reward box. 2. "Mr. Satan Wig": This piece of equipment can you get 37 "Potara Warrior" in PQ. After her "hiding God" arrived on the map since, from time to time Mr. Satan on the back of God's palace stands. Otherwise, there are on the map only occasionally times a time-Patroller and various collectibles. If you Mr. Satan ansprecht then you will receive the item of equipment, which is listed after the completion of the PQ in the reward box. Surely there are more such hidden objects. So it is always worth it to talk to the NPCs appearing. Now that I have done this dozens of times and nothing happened, I noticed that this was translated apparently wrong. For this to work, both must be in the SSJ4 mode, now defeated first SSJ4 Goku. When he was defeated, appears with a little luck, now the word "Finish" and SSJ4 Vegeta escapes, whereupon SSJ4 Gogeta appears. Now just him and then SSJGSSJ Goku + Vegeta defeat to complete the PQ with a Ulti finish. You need the DLC Pack 3 for it. 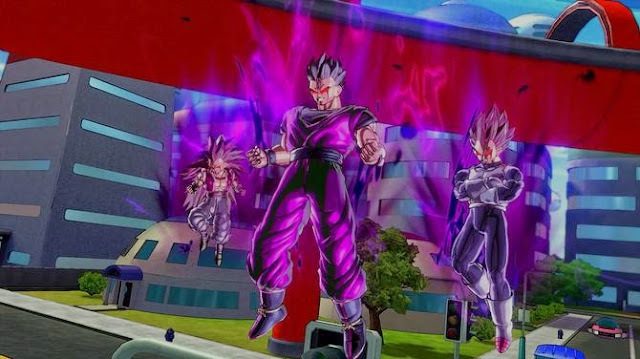 There are indeed in the DLC Pack 4 New Characters. One is including Jaco. He looks weak at the beginning, but has a very strong combo (which is also very cheap). 2. Beat until now with square to this end. 3. Beat fast it is to up this to an end with triangle now. 4. Repeat steps 2 and 3 until you're interrupted. In practical terms, this is an infinite loop until the enemy is dead or somehow escapes with an attack or a teleportation. Therefore, it would be very useful to bring empty the endurance of your opponent first. After that you can make your opponent finished with your heart's content. However, you may be interrupted by an opponent if you do at one and the other beat you.